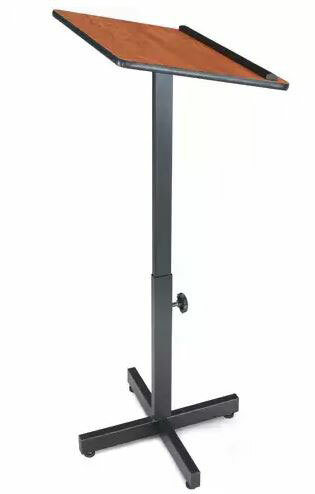 The Oklahoma Sound 70 Portable Presentation Lectern is both practical and convenient for all speakers with continuous adjustable height. 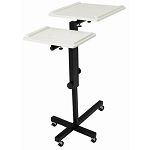 It comes with a generous paper/book stop for your presentation materials and a reading surface that is 16 x 20 W.
Color selections available: Walnut, Medium Oak, Light Oak or Mahogany Laminates (black edge and base/pole in black enamel steel). 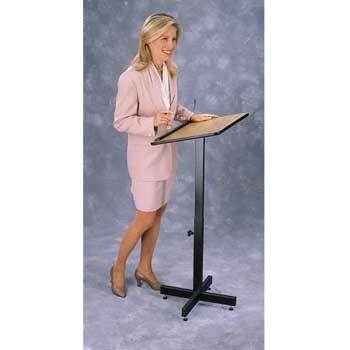 Adjustable Height - 30" - 44"
Competitive Edge Products, Inc. is an authorized retailer of the 70 Portable Presentation Lectern manufactured by Oklahoma Sound. Everything as promised! Fast Shipping! Great! Wow ... ... fast shipment on a well known product. A: The OS has an unprecedented 5 year warranty on all products. Fast Shipping: Orders for the Oklahoma Sound 70 generally leave the warehouse within 1-2 business days. This product has 30-day returns: Simply hang on to the original packaging and contact us within 30 days of receipt if you are not satisfied with this product. We are that confident you will love this product! If something is damaged or defective we will get it replaced at no cost. Our items have an extremely low return rate. The reviews speak for themselves. Please contact us before purchasing if you are unsure whether this product is right for you by calling us toll free at 866-308-5484 or via email at websales@competitiveedgeproducts.com Please note that we are happy to waive any restocking fee if the item is unused and in the original packaging. Dimensions: 29" x 22" x 3"